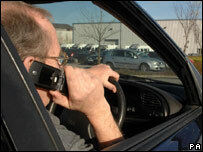 The motorists were caught driving while using hand-held mobile phones during a month-long campaign throughout March. Holding a mobile phone while driving is now an endorsable offence, punishable by a £60 fine and three penalty points. Sgt Simon Goldsmith said: "It only takes a few seconds distraction from a mobile phone to cause an accident with fatal consequences." He added: "The fact that such a large number of people have been caught using a mobile phone while driving shows that some people are not taking this change in penalty seriously."